Here is a recent photo for 7/23. showing current conditions for the Ptarmigan Ridge. Current photos of the route. More to come soon. Some recent photo of the Mowich Face from a independent party. They reported good conditions on the Central route with some difficulties on the lower glaciers. Current photos of the route. More to come. Here's some photos of the route from a flight around the mountain early this season. Climbing rangers were able to tie in a patrol on the Tahoma Glacier while conducting training on the west side of the mountain this past weekend. Although the character of the Tahoma Glacier seems to be have changed over the last few years, both the Sickle and the Tahoma Glacier routes appear to be a go with a little bit of quality route finding. There has been a lot of ice fall activity on both routes so be sure to move your team wisely through these zones and keep a heads up as conditions continue to warm. St. Andrews Rock, Sunset Amphitheater, Sickle and Tahoma Glacier. Currently, St. Andrews Rock doesn't seem like a plausible camp for any of the routes surrounding the Puyallup Cleaver. Glacial recession and lack of snow make getting up onto and off of the St. Andrew's saddle sketchy at best. There is however a descent bench around 10,800ft. at the base of the Tahoma Cleaver. 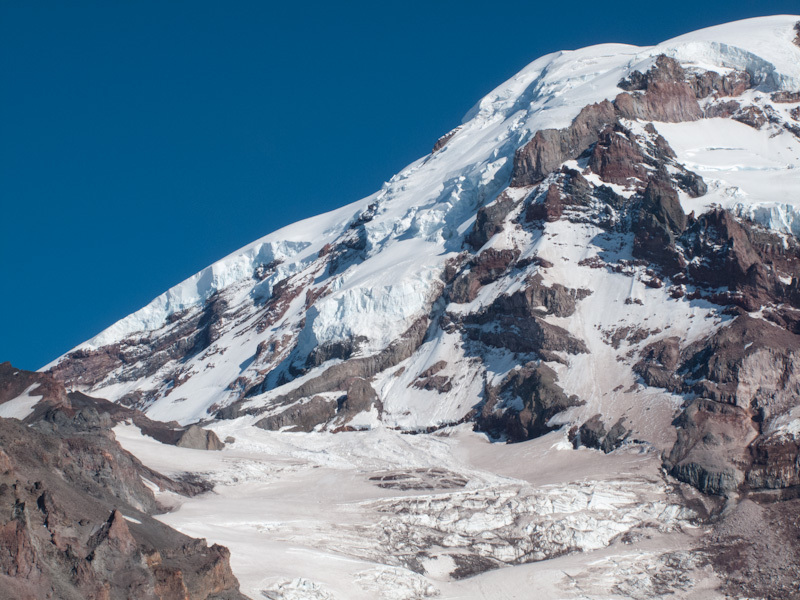 Again, watch for ice fall from the Tahoma ice cliffs and rockfall from the Tahoma Cleaver. From the bench, routefinding is fairly strait forward with a few larger bridge crossings to gain the steeper terrain around 12,000ft. Conditions were prime at 5am for easy two tooling action and good snow for vertical pickets. As summer rolls on you can most likely expect anything from loose wet snow to glacial ice on this slope depending on your timing. This might be a good zone to extend your ropes and put those lead skills into practice! One or two more hollow bridge crossings gets you to lower angle terrain and the meat of the route with almost 2,000 ft. of 35 degree slogging ahead of you. Photo from a flight around the mountain early this season. The Finger has melted out near the hour-glass feature right above the Wilson Glacier. With this rock step and added rock fall from the melting Wilson Headwall, climbers and skiers have been avoiding this route until next the next season. A few photos of the Fuhrer Finger and Wilson headwall from before the latest storm cycle. The mountain has received up to 8 inches of snow at 11,000ft which could have reset the route for the next few days. This snow came in with significant winds which has elevated the avalanche danger. Notice the extent to which the finger had melted out, and the dirty debris coming off the Wilson headwall. See the trip report below for good details on this route. It's still in great shape! Here's a current photo. See you on the mountain! Whether you're planning on skiing it or climbing it, the Finger is in good condition and is bound to provide a high quality experience. There are a few cracks poking through in the Nisqually, so keep an eye out, especially with the warm weather we've been having on the lower mountain. Fairly benign travel from the Wilson Gully up to the Castle. Watch for rockfall both crossing the Wilson and climbing the Finger as well as coming back. There is a shrund which limits travel directly up from the finger and forces climbers out (climbers right) towards the Nisqually. The upper-most bridge directly below the rocks appears the most stable and the most in-tact. Steep climbing from this point to the Wapowety cleaver, then a bridge crossing and glacier travel up the Nisqually to the summit. Again watch for rockfall in this zone. Whether or not parties are above you are not, keep your eyes uphill and on the lookout for falling objects. Current route photos. More to come soon. The ledges are starting to get their winter-coat back on. Considered the "standard route" in the winter months, Gibraltar Ledges is considerably more challenging than the "standard route" in the summer (the Disappointment Cleaver). Some of the challenges are due to the season - winter storms are harsh on the upper mountain. They roll in quick, sometimes without warning, and can kick out the jams for days without letting up. The days are shorter and thus climbers have less time to navigate up and down from the summit in the daylight. New, unconsolidated, and deep snow covers the mountain and slows the pace at which climbers can ascend. Since there's no melt-freeze cycles occurring, like there is in the summer time, climbers can find themselves wallowing waist deep. Lastly, with the colder temps, higher winds, and more precipitation in the winter months, small human-errors which happen to all climbers (like forgetting your lighter, dropping a glove, breaking your sunglasses/goggles) can have fatal consequences. Other challenges come from the nature of the route. The ledges themselves are narrow and portions don't allow time to self-arrest if a climber does slip. 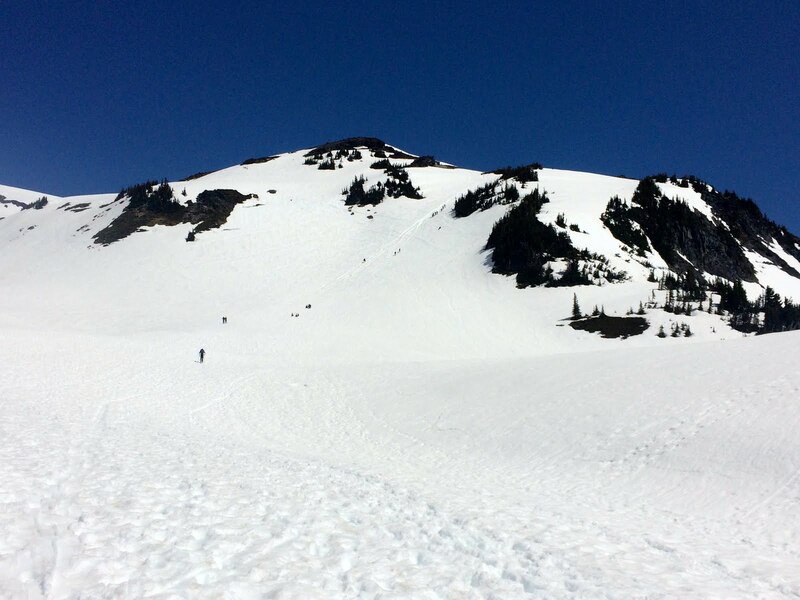 The Cowlitz Glacier approach and the Gibraltar Chute exit is steep and can have high avalanche danger. And lastly, the upper mountain portion isn't climbed often enough to form a boot-pack and there's no wands. Climbers must navigate around crevasses and find a route to the summit using their best judgement to avoid hidden crevasses. When deciding to climb the ledges in the winter, please come prepared, have a good weather forecast, and track the storm cycle history for the two weeks before your climb so you have an idea of the avalanche dangers you'll encounter. Most likely you'll have the mountain to yourself which means you must have a plan for self-rescue if a member of your team gets hurt. Though the challenges are many and can be extreme, climbing Rainier in the winter can offer one of the most rewarding experiences. The solitude is unmatched. Views in the winter air are at their best. And the mountain looks its greatest with a fresh white suit. Enjoy! The Gibraltar Ledges route is currently out of season due to the lack on snow on the south side of Gibraltar Rock, extreme rockfall hazard, and a large bergschrund once you climb to the chute prior to Camp Comfort. The route is still "in" and climbable, but fading quickly. The Cowlitz Glacier approach is getting a bit broken just above Camp Muir and the typically snowy ledges used to traverse alongside Gibraltar Rock and up to Gib Chute to access the upper mountain have been melting quickly. Come climb this route while it's still in shape! Current photo of the route. More to come soon. Climbers have already started avoiding the Ingraham Direct due to worsening crevasse crossings and increased chance of rockfall as the route moved closer to Gibraltar Rock. Guide services have climbed the cleaver and thus a good "kicked-in" trail has been established (for now). Know your crevasse rescue skills if you choose to attempt the Ingraham Direct and also be cautious of lingering weak layers in the snowpack. There is no avalanche forecasting for the upper mountain on Rainier so teams must be able to assess avalanche danger themselves. For 2015 route conditions, photos, and information follow this link: Ingraham Direct 2015. Fresh snow and cold weather has definitely taken hold on the snowfield. 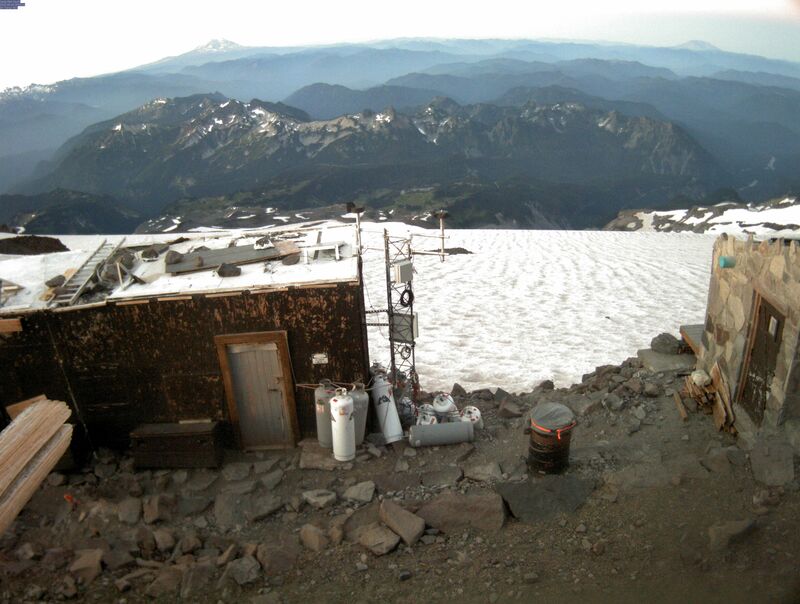 There's no longer a boot-pack to and from Camp Muir since the guided climbs have ceased for the summer. Wands this time of year are sporadic at best. Please bring and know how to use a GPS and set a track log if you decide to hike to Camp Muir in the winter! The toilet at Panorama Point is still open, but will close sometime in late-October. Hot weather continues to change the face of Muir snowfield. New rock outcroppings are starting to take shape and become more prominent features of the landscape. This time of year it can become increasing hard to navigate in conditions where poor visibility can make one rock pile look like the next. Make sure you always have a way to navigate home (GPS). If you're a map and compass person, make sure to stop by the CIC to pick up a bearing map sheet of the snowfield. With all the recent warm weather the snowfield has become very sun cupped with a nice dusting of volcanic grit on the upper layer. It's sad to say, but the snowfield has very poor skiing conditions once we hit August. There are still no crevasses or glacial ice that have made themselves known. 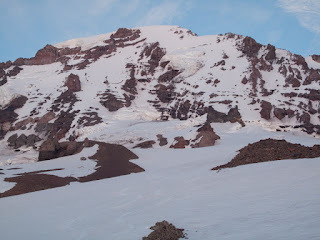 Make sure to pack sunscreen and water up to Camp Muir as there is no source of drinkable water other than melting snow. If you do get a permit to camp on the snowfield, make sure you are camping an a snow platform rather than on the rocks. Even with all the recent high pressure, remember that the conditions can change quicker than you can imagine. Please come prepared with warm clothing and equipment to navigate in a whiteout if visibility decreases. Please make a point to pack out your blue bags and all your trash. The Rangers here try their best to pack out the trash they find, but we need your help. If you find micro trash or wrappers or the like on the Muir Snowfield, please make a point pack it out (even if it is not yours). Its up to all of us to keep out park free from litter. The Muir Snowfield is still holding together and no crevasses are readily apparent above Pebble Creek, but with the hot temps and sunshine in late-July, they'll be here soon. 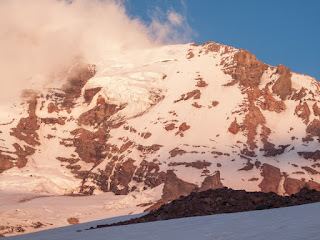 Please remember to camp on the snow if your party gets a permit for the "Muir Snowfield" instead of Camp Muir. Camping on rocks destroys the micro-flora and creates unsightly tent rings and contributes to trash being left behind. Also - don't forget both hot-weather gear AND cold-weather gear this time of year. Lots of hikers have been forgetting their sunglasses which can damage eyes! Please remember to wear sunglasses! Also, just because the daylight hours are warm - it can still snow in July. Bring the parka and hat in case a storm rolls in, and a way to navigate back to the parking lot in a white-out. 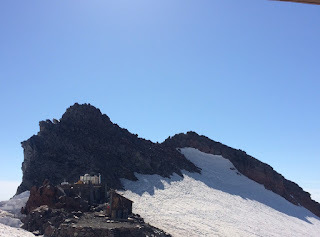 The approach to Camp Muir and the Muir Snowfield is still slowly melting out. The trail system to pebble creek is mostly dirt but still has some snow patches along the way. Many social trails develop around these melt out zones and seen in the picture to the right. These trails can cause irreversible damage to flora and fauna and create erosion problems that are difficult to fix. Please be mindful in these melt out zones and look for signs or the best path that will keep you on the trail and cause the lease amount of damage. The Muir snowfield is well traveled but not always well marked. The guide services maintain wands that can be use to help lead the way during white out type conditions, but they are few and far between. Other wands can be found on the snowfield as well. Some are from old trails or independent groups, or moved from kids playing in the snow on a sunny day. Make sure to have your GPS handy and don't assume that the wand you see in the snow is leading you the direction you want to go. The snow is staring to get down to a level where ice is starting to show up on the surface in some locations. It is not to the point were crampons are needed but be aware of slick spots when coming down hill. 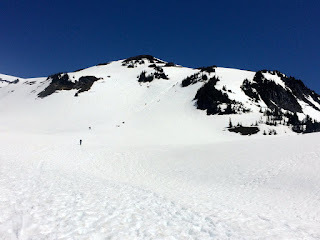 The Muir snowfield is still in typical shape for early to mid July. After a very hot month of May, the June storms and cool temperatures slowed the melting on the snowfield. Unfortunately, for all you skiers and boarders out there, the melt off has still been happening quickly in the Paradise meadows. The trail from the parking lot in Paradise is completely snow free for the first one half to one mile. From this point, up near Alta Vista, the snow is quite patchy with large swaths of the trail being melted out. With that said, please try and stay on the trail as it meanders in and out of the snow. The vegetation is particularly vulnerable when it is first melting out of the snow after a long winter. Above Alta Vista leading to Pan Point and Pebble Creek there are a few large patches of snow hanging in there, but they are going fast. Once to Pebble Creek, the snow is continuous all the way to Muir, with a well worn boot track much of the way. The snow surface of late is becoming quite textured, with small sun cups developing on much of the snowfield. There are many sporadic wands marking various paths heading to Muir. Please do not rely on these wands for navigation, as you do not know who placed them, or where they were heading. Wands are a great tool for poor weather, but if your team chooses to place wands along the route to Camp Muir, please remove them on your way down! For those hearty souls that do not want to hang up their skis for the summer, it is still feasible to get a couple thousand vertical in from Camp Muir down to Pebble Creek, and with the current weather pattern the skiing may get a nice little reset back to smooth conditions. Please keep in mind that though it is July, the weather forecast for this weekend calls for freezing levels down to 6500 feet at times, with precipitation, low visibility and winds. A rather winter like weekend! So if you are planning to come search for some summer powder on the Muir Snowfield, please be prepared for a variety of conditions, and have the proper tools to navigate in low visibility conditions. Who knows, maybe winter isn't over just yet on our favorite local volcano! The Muir Snowfield received some new snow over the past few days. Paradise received about 3" today. Travel from the Paradise parking lot is still mostly snow with occasional trails sections appearing. The summer route is being used now, so please observe trail signs and markers. Navigating the snowfield over the past few days has been challenging with whiteout conditions despite having a well wanded path from pebble creek. Today gave way to some nice weather up high on the mountain. Some additional days of high pressure are forcasted for the next few days. The snowfield has been holding strong even with all the warm weather early this season, Small sun cups are starting to develop, but the climber's boot pack has consolidated quite a bit and traveling to and from Camp Muir is practical even without snow-flotation. Currently wands are few and far between so be sure to bring a GPS unit and know how to use it. The summer route (the switchback from Glacier Vista back to Panorama Point) has been kicked in and is the current standard route up to Pebble Creek. Be cautious of fragile meadows just beginning to melt out. It might just look like a patch of rocks and mud, but by late-July, if the soil patches haven't been trampled, alpine flowers bloom and make the mountain smell much better. Day-hikers do not need a permit to hike the snowfield. Hikers who plan on spending the night are required to get a permit in-person at a ranger station. Climbers need both a permit AND a climbing pass. The consistent sunny days and warm temps has produced some major snow melt. The winter route is still in going up Panorama Point but not for long. Expect to see a change over to the summer route in the next few weeks. Many fragile alpine flora and fauna are now becoming exposed on the approach, so please respect these areas and steer clear. This is the time of year where may of these newly exposed zones get trampled by visitors causing social trails and erosion damaged that can take years to regenerate. The snowfield from Pan Point to Muir is seeing a lot of ski traffic and for good reason. The snowpack is in good spring condition with many lines like the Nisqually shoot still in. The winter route is changing with the snow melt and tracks are cutting down towards pebble creek. Please observe this trend and stay on the snow. The "winter" route is still the most popular route to get to Camp Muir. 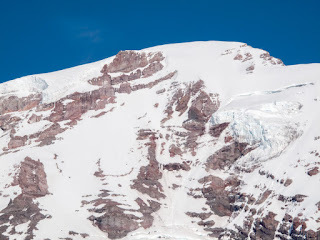 Teams have been ascending directly up Panorama Face and skirting from there over towards McClure Rock and finally up through Moon Rocks to get to Camp Muir. The "summer" route and switchback to get up to Pebble Creek hasn't been kicked in yet. Make sure to come prepared - especially with the early season storm potential. It's still May and the Pacific Northwest can kick out the jams this time of year. Storms can roll in with little warning so be sure to have a method of getting back to the parking lot (this means have a GPS, extra batteries, set a track log, and be dialed in with how to use it). Day hikers do not need a permit for the snowfield. Hiker and skiers that plan to spend the night at Camp Muir do need a permit. And finally, Climbers need a permit AND a climbing pass. See the permits and registration link above for more info.